The title of the study “In Search of Strategists” says it all. If an IT manager does not have the ability to think strategically about their work and the work of their team, they simply aren’t realizing their true level of potential value. 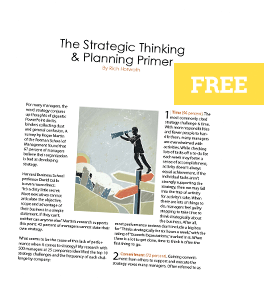 Strategic thinking is about generating insights that lead to competitive advantage. IT managers are in the envious position of leading the management of data and information, which gives them the perfect opportunity to identify insights. After all, an insight is when you’re able to combine two or pieces of unrelated data or information in a unique way to create new value for internal or external customers. Failing to train IT managers on strategic thinking means failing to capitalize on insights which could make or break the business. For most companies, understanding how technology aids their strategy is critical to success. But, simply creating a “Technology Strategy Roadmap” misses the big picture. As with any sound business strategy, IT needs to develop solutions that create new value for customers. Those customers might be internal employees or external in the marketplace. Either way, technology strategy is a part of the overall strategy to deliver new and differentiated value. Integrating IT managers with leaders from other functional areas such as operations, marketing, finance, sales and HR is the only way to ensure a strategy dialogue is leading to a unified strategic direction. Otherwise, you’ve got nothing more than a ham radio fest on your hands.